was. The ballroom was beautifully laid out with a nice area down the middle for the models to show off a lovely selection of clothes. Before long the tables started to fill up and eventually there were about 110 people who had attended to support NCCCT and enjoy the fashion show and the buffet lunch laid on by Jasmine Court. huge selection of hot and cold starters and main courses together with yummy desserts to finish off. Everyone made their choices and it looked as if everyone was thoroughly enjoying the meal. 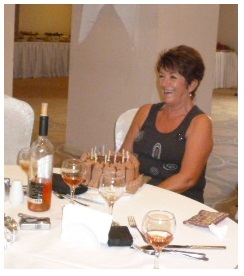 At one point a cake, complete with candles, arrived and was presented to Cath Dunbar who was celebrating her birthday that day. Raffle tickets were being sold and there were some lovely prizes on display. Also on display were many articles of clothing which could be bought, as well as the items which were to be modelled later. After the guests had finished their lunch, the fashion show commenced. 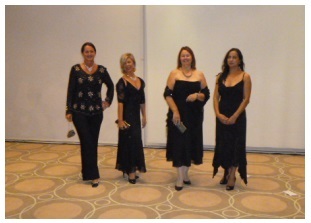 There were 4 models, Sandra, Olga, Nur and Dawn and they modelled all of the clothes in a very professional manner. There were some lovely items, one of which I fancied, but unfortunately I was beaten to it by one of the other members of the audience. Never mind, perhaps it wouldn’t have fitted me anyway! oney donated to the charity is used to purchase hospital equipment. Reclining chairs at a cost of 1,000TL each have been purchased for chemotherapy patients. A defibrillator has also been supplied as well as a Treadmill and a Molemax machine which is a computerised system for checking moles and other skin lesions. 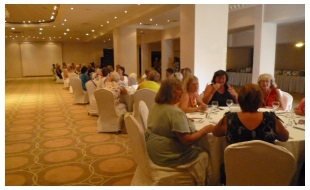 Alsancak and at The Lodge in Çatalkoy and also Triggs Quiz also at The Lodge. These are all events which raise funds for NCCCT and the support for these events is very much appreciated. 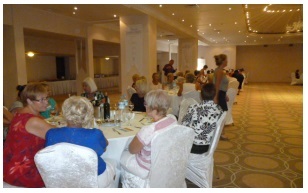 The fashion show and lunch was a very successful event and raised 2,862TL for NCCCT. It was indeed a very enjoyable afternoon at a lovely venue. To see some of the lovely selection of clothes, see the following slideshow. 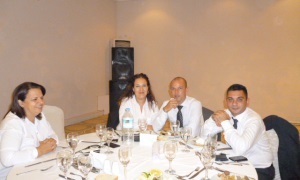 TRNC News Today 23rd October 2013 – Agreement, We Can Break The Ice!